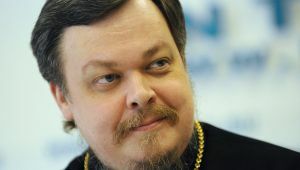 Russian Orthodox Church spokesman Archpriest Vsevolod Chaplin has sharply criticized abortions, comparing them to Holocaust, and has said he hopes Russians will consider them unacceptable. “Abortions are the most terrible Holocaust in humanity’s life,” said Chaplin, who led a rally and a prayer against abortions and homosexual propaganda in downtown Moscow’s Gogolevsky Boulevard on Sunday. “Abortions have killed more people than all world wars. So I hope they will be morally unacceptable in Russia,” the archpriest said. Demonstrators held placards that read “Stop killing children” and “Moscow is not Sodom.” They called for nationwide laws to ban abortions and propaganda of homosexual relations among minors. Laws prohibiting such propaganda have already been adopted in a few Russian regions. A similar rally took place in the city of Kazan, the capital of the Volga republic of Tatarstan.